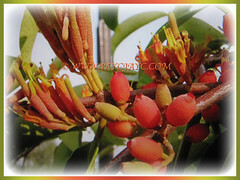 Malayan Mistletoe or Mango Mistletoe is a parasitic, woody and dioecious shrub. This plant has been used for traditional medicine. Grow this beauty to enjoy its brilliantly coloured red berries that persist on the plant for a very long time. Botanical Name: Dendrophthoe pentandra (syn. : Loranthus pentandrus, Dendrophthoe facinosa). 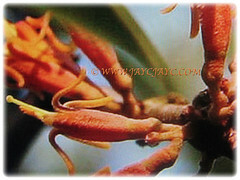 Common Names: Malayan Mistletoe, Mango Mistletoe, Mistletoe Plant. Etymology: The genus name Dendrophthoe is made up of two words, that is dendro meaning tree and phthone, meaning waste away in reference to its hemiparasitic habit on trees. The specific epithet pentandra means five stamens. Origin: Native to Indonesia, Malaysia, Philippines, Thailand, Vietnam, Cambodia, East India, Guangdong, Guangxi and Yunnan. 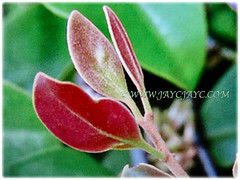 Plant type: An evergreen and dioecious shrub. Features: Dendrophthoe pentandra is from the genus, Dendrophthoe that comprises of 59 accepted species of flowering plants. It is a parasitic and woody shrub that can grow up to 2 m tall. 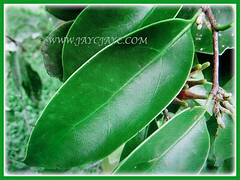 Its simple and green leaves are arranged alternately along the branches. They are lanceolate to elliptic or sub-orbicular in shape, 5-15 cm wide and 8-10 cm long. Petioles are 5-20 mm long. 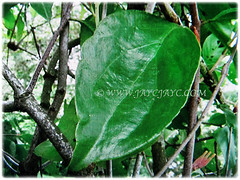 The leaf blade is thick and leathery, lateral veins 2-4 pairs, base cuneate or obtuse, apex acute or rounded and glabrous. Its stems are greyish and scattered lenticellate. The cylindrical and bisexual flowers are borne on axillary racemes that are solitary or 2 or 3 together, 3-10 flowered. The corolla is orange and is slightly inflated at the base. The stamens and stigma are extruded. Pollination is by butterflies and moths. Simple and fleshy fruit is a red berry, 8-19 x 5-6 mm which is minutely pilose or glabrous. Culture (Care): Dendrophthoe pentandra or Malayan Mistletoe grows easily with the least maintenance. Soil: Humus-enriched, moist and well-drained soils. Others: A parasitic plant, its growth on the host tree needs to be kept in check to prevent deterioration of the host tree. If the host trees have mistletoes growing on them, the mistletoes will continue to supply pollen and honey from their flowers, fruit and leaves as food plants for caterpillars and the painted Jezebel butterfly. Generally free from serious garden pests and diseases. For subtropical and temperate regions: Hardiness: Not applicable. Propagation: Easily propagated from seeds. 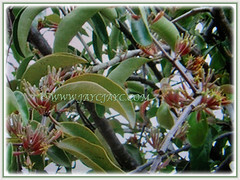 Usage: Dendrophthoe pentandra or Malayan Mistletoe will be excellent when grown in public parks and gardens. Mistletoes are a valuable food source for a number of animals. Despite them being a parasite, they are very important food resources for birds and butterflies. Sunbirds and flowerpeckers frequently visit the flowers for nectar and also for their fruits. Besides, this parasitic plant that has been used for traditional medicine. 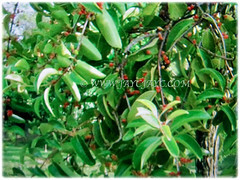 It has been known that Dendrophtoe pentandra extract has anti-inflammatory and anti-cancer properties. It’s known as one of medicinal plant used in traditional/alternative medicine in Indonesia and other countries such as in treatment for cough, diabetes, hypertension, cancer, diuretic. Capsicum frutescens cv. Bird’s Eye is super pungent!